Description: This beautifully illustrated full-color brochure documents the growth stages of a baby for nine months in the womb. 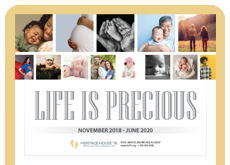 Using the artwork from the popular Watch Me Grow poster series, these brochures make an excellent teaching tool for pregnancy centers, schools, or doctor’s offices. A great resource to have on hand in any waiting room. We use these in both English and Spanish. Whenever I watch someone open one of these pamphlets, they are engaged. They look at all of the pictures. My kids always ask if they can keep these for themselves. Great for sidewalk counselors, pregnancy resource centers, and public outreach. Working recently at a Pro-Life booth at a County Fair, this brochure was very effective especially with children. I give these brochures to women at the pregnancy center where I volunteer, and displayed them in my Parish. They are beautiful and one of my favorites. This beautiful brochure is always a hit at the Women's Expo our Respect Life Committee attends each year. People love the clear commentary, the pictures, and the friendly style. We order these again and again. One of my all-time favorite brochures for education on LIFE! Perfect for new parents and anyone else, because we ALL need to know of the humanity of the unborn child!